The Harrowing Question of All Is Lost: How Do You Mourn Your Own Death? Director J.C. Chandor talks about his influential near-death experience, the financial side of filmmaking, and "embracing the weakness" of movie scripts. When filmmaker J.C. Chandor was 19, he almost died. "I was in a horrible, horrible car crash," he told me in an interview last week. ”You know, pulling myself out of the wreckage of a car, pulling myself onto the grass on the median of a highway. It was very, very intense." The near-death experience stuck with Chandor, forcing him to confront his own mortality in a hard, terrible way. Twenty years later, Chandor's new feature film, All Is Lost, presents a determined parable about that same struggle against one’s own vulnerability. Notable for both its ambition and its restraint, the film opens with a man stranded on the open seas off the Sumatra Straits, thousands of miles from Indonesia. (That man, played by Robert Redford, is given no name. He is "Our Man," according to the end credits.) He writes a letter, rolls it inside a bottle, and drops it into the ocean: "I think you would all agree that I tried. I will miss you. I'm sorry." He hardly says another word—and that's the immediately remarkable detail of All Is Lost. It's an almost silent film starring one of the most recognizable actors in the world. Not that Chandor isn't notable in his own right. Dubbed a "rising young filmmaker" last month by New York Times critics A.O. Scott and Manohla Dargis, the 39-year-old director spent a decade and a half making commercials before making 2009's Margin Call, a philosopher's thriller about a Wall Street firm racing to unload mortgage-backed securities in the early days of the financial crisis. It was a film about the moral implications of survival—just an incorporated sort, rather than the physical kind Chandor explores in All Is Lost. 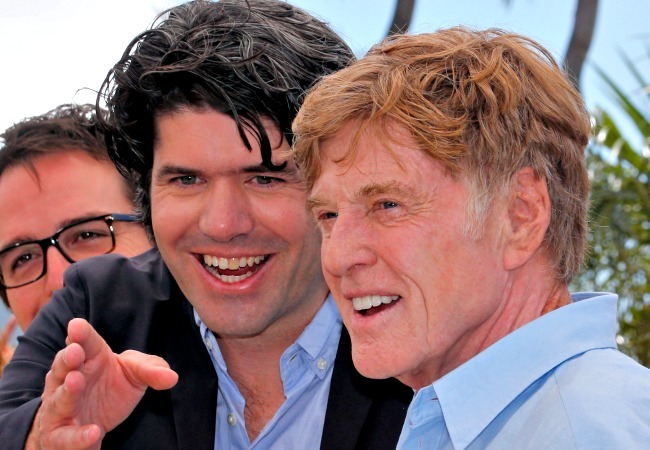 I spoke with Chandor over the phone about the financial difficulties of filmmaking, his creative process, the questions about death he grappled with while making All Is Lost, and the open-ended nature of interpreting allegories. I don't think a lot of people expect to see this kind of movie made in 2013. How did you manage to make All Is Lost in an industry where it seems difficult to develop any ambitious project that doesn't cost tens of millions? I think it's a very interesting time. There's this perception, which is not false, that there was a bubble created by DVDs. In the last six or seven years, that bubble has imploded because of technological advancements and the financial torrents of the world. It was a perfect storm that created very conservative thinking. But, because of technology, we're in a time with the widest range of ability to tell stories that we've ever had in filmmaking. From a budgetary standpoint, you can literally create a feature-film with a phone. We'll soon probably be able to edit one on a phone. So, I tend to think there are amazing opportunities. This film, in a way, is a low-budget film—but it's a weird low-budget film. It's $10 million. It's in the sort of old marketplace, not really a budget you ever really ever see films get made in anymore. You're either making a film below $6 million or above $15 million. In a weird way, I priced this film correctly. I know it sounds crazy to say, but I'm the poster child of the exact opposite of what everyone feels is going on. Lionsgate and Universal Films bought in all on a 31-page treatment, Redford, and my involvement. That was it. We don't even have an equity investor in this film. We actually were able to bank finance. It's the most conservative financing model out there—it's how you'd finance, like, a Jason Statham film. You actually know you're in profit before you ever start, essentially. We weren't quite in profit, but we knew we had the money to make this version of the film. It was unbelievable! By structuring the film that way, we were able to go and make the absolute pure version of this movie. This is what that 31-page document said. Word by word, phrase by phrase, action by action. What was on those pages is what we managed to go shoot. I don't know why, but people took a chance—and not only that, but they supported the chance and they didn't panic at the last minute and force some other version of the movie. It was amazing. It's remarkable that there aren't more movies made like that. One of the things that struck me about Margin Call is that it's a very theatrical movie. I can almost imagine it on stage. All Is Lost is about as far from that style as you can get. Why did you decide to make such a drastically different movie? Why did you go in such a different direction? Thematically, I felt like there were enough similarities that I could take things I was exploring in Margin Call and try pushing them to their most extremes. The simple answer to your question, though, is that the nice thing about writing is that it's free. It's just your own time and your own energy and your own emotional wherewithal that you're expending. I always start a script by asking, "What's the movie there?" but in the early days of this project, I just had this idea. It started with the letter. I actually wrote the letter first and then this movie came around it. When you're starting, it really is just a simple, little idea. Over six, seven, eight months, it started to gain this momentum—both within me and within people I was introducing it to. It starts to be inevitable. You don't even realize you're doing it. The next thing you know, here you are. In another interview, you mentioned that this movie is about you—that it's about your feelings about mortality. How do you confront that kind of question? By making this movie, do you feel more comfortable with death? Yes, bizarrely. I’m hoping that's what the audience will experience. People speak with great confidence about the ending to me, not even knowing—especially people who see the movie alone or in a small group—they don't realize that it has a very specific message. People have very different readings on that ending, quite simply, whether he lives or dies. It's cut down the middle. It's kind of intense. It's what I was hoping, but I never realized it would work quite so well. Essentially, I was hoping it would not be ambiguous for any one audience member, but there would obviously be multiple readings which you're essentially bringing with you. Hopefully, I've given you enough space at that point to have your own moment. I had a very intense near-death experience when I was quite young. I was in a horrible, horrible car crash. I had gone from no one in my family ever dying when I was around or aware of it, when I was 19, to experiencing that. One of my best friends, who was driving me in a car with my three other friends, he fell asleep on a highway. We were on a trip, and it rolled the car seven or eight times. Unfortunately, the driver passed away. I was like—slam!—confronted with believing that I was dead. It was very intense. You know, pulling myself out of the wreckage of a car, pulling myself onto the grass on the median of a highway. It was very, very intense. I had been shielded from deep, emotional thinking almost throughout my whole life up to that point. But then over the next 20 years of my life, I started to drift away. Almost like the reverse of what normally happens. The longer I got away from that event, I started to fall back into certain traps. Both of my grandmothers died in the years prior to me writing this, and I did have a very different view and experience with that. I ended up reexamining what, at one point in my life, I was very in touch with. I had lost that. By losing touch with that, I had started to take certain parts of my own life for granted. My feeling was that there's something fascinating about a guy toward the end of his life, who has presumably lived a pretty good life up until that point, just—what will you do to continue to fight for those days? What is it really like when you mourn your own death? I grew up somewhat religious, going to Episcopalian church. Not in my adult life. I have mixed feelings about it. I consider myself somewhat spiritual, but not practicing. I ask because I find it interesting—given how you put Robert Redford's character, "Our Man," through trial after trial in a way that seems very deliberately to echo Job from the Bible—that you say he is basically you. The interesting thing to me is, that's what the guy was searching for. This person is not going to save someone. He's on an artificially created search for authenticity and challenge. It's something we all strive for, in a way, and finding that while actually having it be meaningful is a really difficult path in life. The fact that the sailboat—which was one of mankind's greatest tools for development for most of our history, and has now been left as an antique, essentially, that's only used for joy—there is something fascinating about that. He didn't need to be there, and yet he finds himself there. Why? Why is he forcing himself to do this? One of the things that strikes me about this movie is how few details you give us about, well, anything. Why did you make that decision? Why did you want audiences to infer it themselves? It was a very specific choice. It's in the original document. Redford and I set certain markers that we wanted to make sure the audience would pick up on. We wanted to make sure that you realized this was not a guy, most importantly, who was rootless or who had been circling the globe for 20 years or something. This is a person who is outside of his comfort zone and had a community that he was leaving. He has a very strong sense of community. That letter sort of lets you know he left something. That was paramount, making clear that he wasn't just some sort of wanderer or something. The other thing is that even though he is an amateur and he is a person pushing himself, he does so with the safety blanket of technology and satellite phones and weather updates and GPS. It was not a suicide mission. He absolutely believes he's going to make it. The adventure he ends up finding is what he was searching for, but it's a "be careful what you wish for" situation. As a writer, I had learned a lot on Margin Call about embracing the weaknesses of a narrative and of a project. A story always has an inherent narrative weakness. Obviously, the inherent narrative weakness of a survival film is that you usually have to bring in these crutches. You know, these narrative bridges. Voice-over, or an inanimate object, or a video camera. Going all the way back to Spencer Tracy in the original Old Man and the Sea, it's slathered in voice-over. I'd always felt, wouldn't it make an interesting version to embrace what's best about a survival film, which is the moment of survival! That limited period of time when you're at most risk. The only real answer to your question is that every time I felt myself doing something a little too on the nose, my entire body seized up as writer and I didn't go that way. That's all I have, to follow that gut feeling. Hopefully, by having that sort of open-ended nature to who he is, you start writing your own film at that point. One last question, since I'm curious: Have you seen Gravity yet? I have not. I'm waiting until all this madness is over so I get to watch it. Obviously, it's my kind of movie. I'd love to know how you think its message about life compares to your movie's message. They're very different because they're doing very different things—but there is this base element that I think a lot of filmmakers are realizing. What type of story does best? For me, I just know that I zeroed in and I realized that the ability, for a film, is to come into a person's life. We all have these moments in life. To go back to Margin Call: You're visiting these people who are, on an ordinary day, just run-of-the-mill bankers going off to do their thing. But you're really able to learn a lot about a person, ourselves, our culture, and our society when you visit them in very specific moments. That's what film can do in a way that TV and other long-form storytelling can't. It gives you this very immersive moment. I think that's something that a lot of these films from this year share. Common people, caught up in something that's very heightened.